The physical requirements for snow sports can take a lot out of you. Most of us spend all day on the slopes and keeping up stamina without getting injured is crucial. Fortunately, staying fit in the off-season can be the trick to avoiding injuries once the snow falls. Here are a few of our favorite exercises that work for both skiers and snowboarders. Getting winded when you’re at the top of a mountain sounds awful, right? A solid cardio routine can prevent that! Frequent running sessions will help keep your energy up and build your endurance once it’s time to hit the slopes again. Lunge exercises are a great strength training method for your legs, which are your greatest tool when shredding down a mountain! You’ll be on your feet all day, so strengthening your legs will provide much needed support. Here’s How: Keep your upper body straight. Your shoulders should be back and relaxed with your chin up. Step forward with one leg while lowering your hips until both knees are bent at about 90 degrees. Your front knee should be right above your ankle. Make sure not to push your front leg out too far and don’t let your other knee touch the ground. Making sure your knees are conditioned for the slopes is going to be crucial to avoiding injuries. 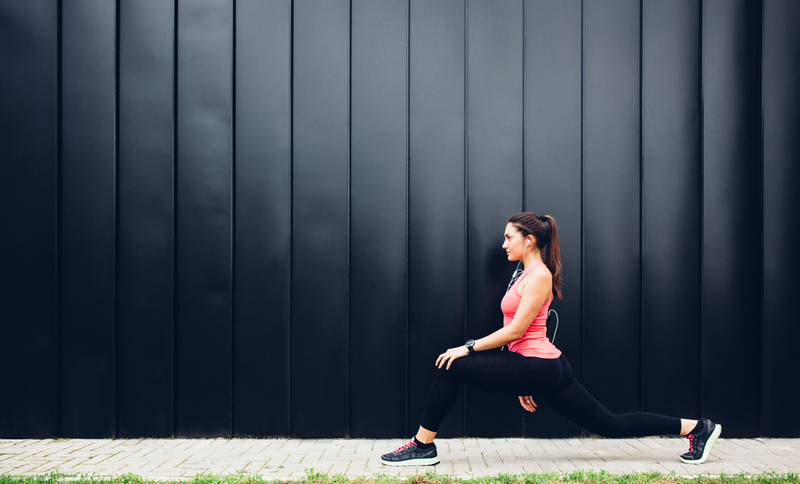 You don’t want to blow your knee out and ruin your season, and single-leg squats will help them prepare for the rough terrain of the mountains. Here’s How: Stand with your arms extended out in front of you. Balance on one leg, with the opposite leg extended straight and as high as possible. Squat down as far as possible while keeping your leg elevated. Make sure to keep a straight back. Similar to the leg squats, this exercise prepares you to react quickly to unpredictable movements—something all skiers and snowboarders need. Here’s How: Start by standing on one leg with the other bent in front of you. Toss a weighted ball back and forth with a partner while alternating legs. Pulling a hamstring on the slopes is the last thing you want to happen after you’ve been longing for the slopes all summer. The toy soldier stretch is a dynamic technique that helps improve flexibility in several muscles in your legs. Here’s How: Stand tall with a tight core. Keeping your knees straight, lift your left leg straight out in front of you and touch your right hand to your toes. Return to standing position and repeat the movements, alternating sides. These exercises, when done continuously, can help you stay fit in the summer so you can hit the slopes hard in the winter. Let us know some of your favorite exercises in the comment section below!